The balloon is an entity released in version 1.28. When held in the player's hand or attached to something, the balloon floats, attached to the object by a string. It is possible to pick a balloon up if the player shift clicks on the bottom of the string and is not further than two blocks away from the first/bottom block occupied by it. If their hand is empty, it will fill the selected slot with the balloon. If the hand slot is already filled, it will look for the first available slot in the hotbar. If the whole hotbar is filled, regardless of whether there are spaces in the inventory, the balloon will drop as an item. This is probably a bug, however it could be intended. 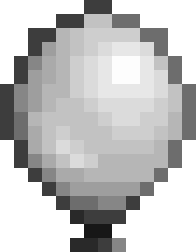 When destroyed by projectiles, TNT or creeper explosions the balloon drops nothing. The balloon is renewable as it is crafted using string and slimeballs, which both can be obtained by killing mobs. The default balloon is white, and in total there are 17 different balloons. If a white balloon is combined with a dye it will produce a balloon of that color. Apart from white, there are 15 other colors a balloon can be dyed. As of now, it is not possible to un-dye a balloon. It is also possible to combine any color of balloon with a ghast tear to create a ghast balloon, which looks like a miniature version of a ghast. This is harder to craft because it requires the player to go into the nether and slay a ghast. Balloons do not really serve a purpose, and are one of the more fun features of Mine Blocks. When a balloon is selected in the hotbar, it will appear attached to the player by a string. The player can attach it to fences or mobs by shift clicking onto the target while holding a balloon in their hand. This will remove the balloon from the player's inventory. If the player shift clicks with a balloon onto any other block, the balloon will be released and float upwards very much like in real life, and most probably despawn, however this is unknown. The player can pick a balloon back up by shift clicking. Balloons absorb projectile when hit by them. This means that they could potentially be used to protect the player from skeleton arrows. A balloon will try to float as high up as it can, but will bounce back to the towards what it is tied to if the string gets too long, and it cannot float through solid blocks. If it gets stuck and the entity to which it is tied wanders more than 8 blocks in any direction, the balloon detaches and floats by itself. The balloon will rotate so that the knot is always pointing to what it is attached to. If the player punches a balloon it will knock it back but will not cause damage. If a balloon is hit by an arrow, spear or bone shuriken it will be pushed back by it and it will take damage, decreasing it's durability value. All combat projectiles will cause the same amount of damage. If it is hit five times it will pop and release particles, dropping nothing. However, it can be enchanted with unbreaking to let it take more hits without popping. Shooting it with a punch bow will knock it further back, but the power enchantment will not increase the amount of damage done to the balloon. It will also take damage from explosion blasts, which cause more depending on how close the balloon is to the center of the explosion. This tweet included a screenshot(below) of a red balloon underneath a large collection of spears. The text above the GUI looks like it said red balloon. When you try to pick up a balloon and your hotbar is filled, it drops as an item, regardless of whether you have spaces in your inventory or not. If a balloon is hit with a flame bow it does not explode, but in real life it would. Balloons are not affected by fishing rods, flint and steel, snow balls, eggs and fire eggs. However this may change in 1.29 when the projectile code changes for snowballs. Player holding a light blue balloon. First screenshot of balloons by Zanzlanz, the balloon is obstructed by spears. A Ghast balloon attached to a fence and a red balloon attached to a creeper. All of the balloons, which are found at the end of the creative inventory. This page was last edited on 2 March 2019, at 10:16.